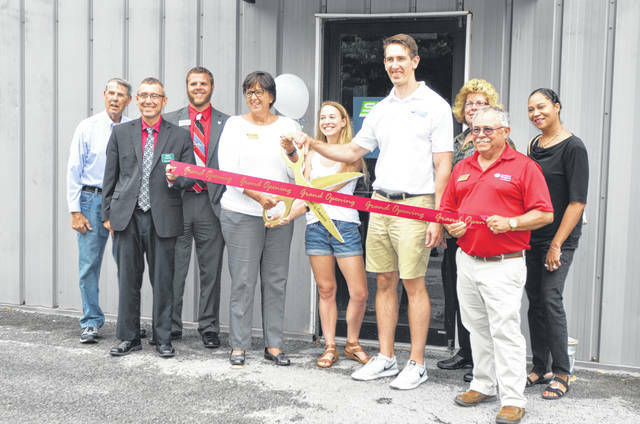 Bill Lamont, Dave Compton, Jason May, Cindy Tenwalde, Grace Meuleman, Dr. Cory Meuleman, Sheila Custer, Wally Kincaid and Heather Jordan help cut the ribbon at the Surge Chiropractic grand opening at 3477 South Dixie Highway, Suite A, Friday. LIMA — The newly open Surge Chiropractic on 3477 South Dixie Highway, Suite A is a practice that not only focuses on the spine and other areas of the body, but the body as whole, according to owner, Cory Meuleman. Meuleman knew he wanted to go into chiropractic care as a way to treat injured athletes, as he had several injuries in high school. After receiving his doctorate from Life University in Marietta, Georgia, he began working for a chiropractic office in Columbus Grove and in April, he officially opened Surge Chiropractic. Surge is a holistic practice that takes into account not only the structural health and function of the spine and extremities, but how environmental factors, nutrition, lifestyle have on a patient’s health. Meuleman provides care for families, physically active individuals and athletes. He hopes to help athletes avoid injuries, recover from injuries faster and enhance their performance. The practice is open 8 a.m. to noon and 2-7 p.m. Mondays and Wednesdays and 8 a.m. to noon Saturdays.